Laura Ashley have just launched a new blog and invited me to post for them. I would have loved to have been at this floral workshop. A charming and super colourful wedding. Loved this DIY hand painted mug. A party in a box. Lusting over the Hudson's Bay blanket. Yvonne shared a great (and easy) DIY on the Live blog. Preview the fifth issue of Anthology magazine. Plenty of colour inspiration at the MT Expo. Victoria let us join her on a tour of Lisa Congdon's studio. Last weekend I felt inspired by autumnal scenes, winter gloves, a fantastic sewing book and more. I shared a home tour of a Sydney-based stylist with a welcoming, eclectic style. 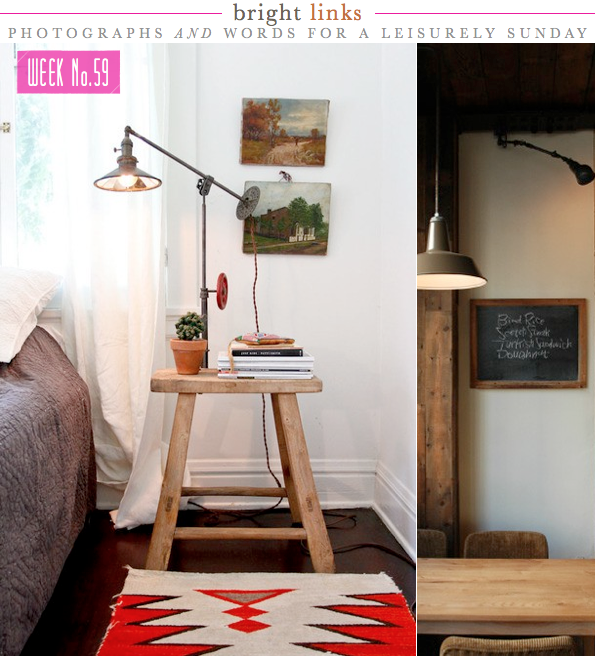 Weathered Glam, Loft Chic & Country Colourful: inspirations for three different home office spaces. My top picks from West Elm's colourful Holiday and party decor. The colourful country kitchen of my future. Unique and colourful art and home accessories by Mariska Meijers. Graphic wallpaper, dinnerware and textiles from the Mini Moderns folks. Seaside, countryside and fireside home accessories from Starfish Bay. Modern products with a global flair from Harabu House. Quirky cards with a dash of whimsy by Le Canot Rouge. Christmas cards from Cards Direct. Party invitations from Tiny Prints. Original and timeless designs by Natural History. Vintage, retro and Mid Century furniture from Hopper and Space. I love the illustrated biography in the Party In The Box - so clever and graphically pleasing! I love the painstaking attention to detail at the floral workshop. And speaking of detail .... The MT Expo looked like bags of fun! Love the beside table! Great links. Have a brilliant Sunday! That is so exciting (Laura Ashley news), congrats and I love the piece you did! Will, posting for Laura Ashley must have been surreal in the best way possible! Such a fun post. Have a great week!! love your Laura Ashley picks, I'm currently working with some of these in a room design too, for a bedroom. @Chi - That party in the box is pretty awesome, hey! @Hannah - Thanks for checking out the links! @Hoolah Tallulah - Thanks! It was really fun posting for Laura Ashley! @Chedva - Thank you, friend! Yes, it was, but fun as well! @Samantha - That sounds great fun, hope it's going well! Loved the laura ashley post - its a lovely blog. Did you see the all white wedding by Nikki at wild at heart - not normally my style to do all white but it is soooo elegant!! Loved the colourful wedding with that fab protea bouquet as well! Thank you thank you for including me in your lovely links Will! I really appreciate the link love :) And I'm wanting to go buy one of those blankets bad!! I hope your new week is off to a great start!